More than 50,000 people from across Europe gathered near the Hambacher Forest in western Germany on Saturday to defend the area from the expansion of coal-fired energy and demand much more ambitious climate action. According to Greenpeace, one of the organizers behind the demonstration, the enormous crowd made up of local farmers, environmental activists, church groups, local residents and supporters from other countries, including Italy, France and the Netherlands. It was the largest-ever anti-coal demonstration in the Rhineland. 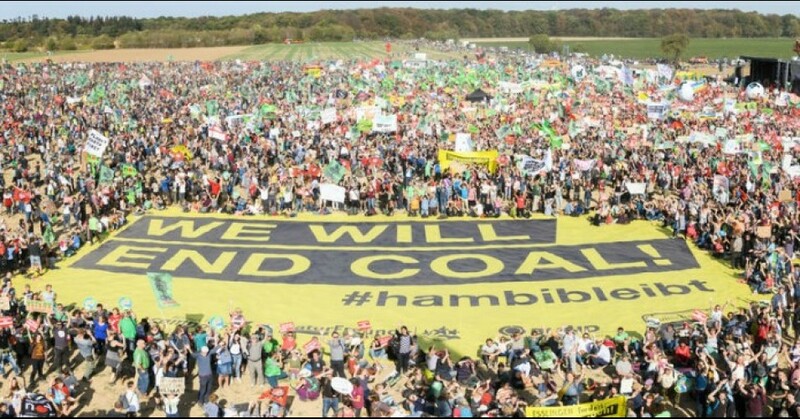 Those attending carried large banners declaring “Farmers against coal” and “We will end coal” as they assembled in a massive field and demanded that the RWE energy group be forbidded from further logging in the nearby Hambacher Forest, the largest of its kind in the region. The green #EndeGelände flags are up in the air. Thousands follow our #Goldfinger into #HambachForest. The mass protest comes in the wake of a legal victory in which a German court forbid RWE from carrying out a clear-cutting operation of the forest. While Germany in many ways has lead Europe, and the world, in transitioning to renewable energy, it still operates the largest fleet of coal-fired plants in Europe and the campaigners say that as long as this is true the nation’s political leadership will not be left off the hook. The demonstration also comes ahead of the release of a new series of reports by the UN’s IPCC on Monday. According to expectations, the latest declaration from the world’s scientific community will again raise the alarm that human-caused global warming continues apace and once more call on the world’s government’s to increase their efforts to curb emissions and reduce the negative impacts of the fossil fuel industry and other polluting sectors. This entry was posted in Agriculture, Civil Rights, Climate Change & Environmental Issues, Corporate Personhood, Corruption, Demonstrations & Protests, Economics, Energy, Government, Human Rights, International Agreements, Peaceful resistance, Religion, Social Justice, Solidarity, Women's Issues, Workers' Issues and tagged Agriculture, Capitalism, Civil Rights, Climate Change, Coal, coal power, Corruption, Economics, Energy, Environment, Fossil fuels, Germany, Greenpeace Germany, Hambacher Forest, Human rights, International Agreements, Protests, religion, RWE, social justice, Solidarity, Women's Issues, workers' issues on October 7, 2018 by ew.